C# Corner is pleased to announce an exclusive offer from the CODE magazine for C# Corner members. June 17 2017. Philadelphia, PA.
C# Corner is pleased to announce a partnership with CODE Magazine! C# Corner members are entitled to a FREE 6-month subscription to CODE Magazine. The subscription is available for both the print and the digital editions of CODE magazine. CODE Magazine recently celebrated their 100th issue milestone. CODE Magazine is an independent, advanced technology publication for developers and technical managers focused on providing in-depth information about today's development topics. Articles are written by developers for developers. 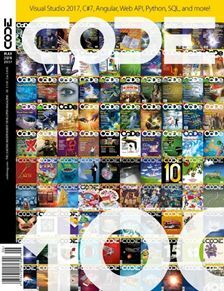 Each bi-monthly issue of CODE Magazine contains detailed and very practical articles covering current technologies and developer tools. Note: Print subscription is only available in United States.